Take a little imaginary trip with me. You want to buy a new car and you are dreaming of all of the great places you can go and hikes you can take. You’ve done your research, you’ve identified a favorite model, you know the mileage and quality ratings, and you’ve made up you mind! That dream car is going to be yours. You spend the obligatory two hours at the dealer and drive away with your dream vehicle. You drive it home and park it in the driveway. Time to head out to your first destination! You pile your hiking gear into the car and head for the Appalachians for your first hike. You didn’t read the fine print. This car purchase plan only includes 5 destinations and the Appalachians aren’t in the plan. Each new destination is going to cost you a bundle. Welcome to Key Management System licensing. Most Enterprise Key Management Systems (KMS) work with this licensing model. You will usually find that you need to license each end-point that connects to the key manager. One end-point may be included in the KMS pricing, but you need to purchase additional “license packs” to attach additional systems. Or, you find that your KMS only supports a limited number of encryption keys. As soon as you roll your keys to meet compliance requirements, it is suddenly time to purchase capacity for more keys! Or, for that new encryption project, you may find that you need to purchase new software to enable encryption for that environment. And it can get really bad when you discover that the KMS system comes in different hardware models and you suddenly need to purchase an entirely different hardware model and do full replacements. That’s painful. This typical KMS licensing model works really well for the companies that sell them. For companies who need to deploy encryption? It means going to management for new budget approval every time you want to extend your security through better encryption. Over time this can add up to hundreds of thousands or even millions of dollars in new license and maintenance fees. We never charge you fees for connecting a new end-point that needs a KMS. We never limit the number of encryption keys generated or stored on the KMS. If you have a hardware HSM, we do not force you to re-purchase the KMS at end of life. Just replace the hardware and keep on keepin’ on! Fortunately, the story about purchasing a car was completely made up. But the nightmare of KMS licensing is real. Just know that it doesn’t have to be that way. Take a look at our KMS offerings and see a new path forward. Pinch yourself. And get ready for that dream trip. We provide Alliance Key Manager as a hardware security module (HSM), as a VMware software appliance, and as a cloud instance (Azure, AWS) - All running the same key management software with the same interfaces and applications. A rose is a rose is a rose - let's talk KMS. HINT: In the following discussion, pay special attention to the words “system” and “service”. I’ve added emphasis below to help with clarity. An Enterprise Key Management System is a security appliance (hardware or software) that manages encryption keys through their entire lifecycle - key creation, key activation, key use, key expiration or retirement, key escrow, and key destruction. The “Enterprise” part of this descriptive phrase is often dropped, and these types of system are often referred to as Key Management Systems. The word “Enterprise” is often used to indicate that the key management system can be used for a wide variety of purposes within an organization. Key Management Systems may be hardware devices (usually hardware security modules, or HSMs), software appliances (think VMware virtual machines), or cloud instances. Their use is dedicated to a single organization and usually managed by security professionals within that organization providing the organization exclusive custody of the encryption keys. Key Management Systems are usually validated to the FIPS 140-2 standard by the National Institute of Standards and Technology (NIST). Here at Townsend Security we provide our Alliance Key Manager as a Key Management System available as a Hardware Security Module (HSM), VMware virtual appliance, and as a dedicated cloud instance (Azure, AWS) and is FIPS 140-2 compliant. A cloud service provider’s Key Management Service is generally a multi-tenant, encryption key storage service managed by the cloud service provider that provides a subset of encryption key lifecycle management. Administrative duties for encryption keys are a shared responsibility of the cloud service provider and the organization that uses the keys. This means that the organization is sharing custody (ownership and access) to encryption keys. Cloud-based Key Management Services are not FIPS 140-2 validated, but may be partially backed by Key Management Systems which are. Examples of cloud service provider key management services include Amazon Web Services Key Management Service (AWS KMS), Microsoft Azure’s Key Vault (Azure KV), and Google Cloud Platform’s Customer-Managed Encryption keys (GCP CMEK, also known as GCP Cloud KMS). The cloud service provider’s use of the “KMS” acronym adds substantially to the confusion. Just remember that cloud service providers implement a multi-tenant, shared “service” and not a dedicated key management “system”. Townsend Security is not a cloud service provider and does not provide multi-tenant, shared custody key management services. Independent Software Vendors (ISVs) provide Key Management Systems that are not managed or accessed by the cloud service provider or the ISV, and which are dedicated to the user organization. This means that the cloud user is not sharing custody (ownership and access) to encryption keys and has full and exclusive management, ownership, and access to encryption keys. ISV cloud Key Management Systems provide support for the entire key management lifecycle including key creation (key establishment), key activation, key distribution, key backup and escrow, and key destruction. ISV Key Management Systems are not FIPS 140-2 validated, but may be based on software that is FIPS 140-2 compliant. An ISV’s use of the “KMS” acronym more closely reflects the Enterprise Key Management System described above. These are key management systems that are dedicated to a single organization and which support the entire lifecycle of key creation, key distribution, and key escrow. Townsend Security provides its Alliance Key Manager solution as a dedicated, single tenant, Key Management System on the Amazon Web Services and Microsoft Azure cloud platforms. The solution can be located in the relevant Marketplace. One small variation on the theme of cloud service provider Key Management Services involves the ability to import your own encryption key to the cloud service. In this case the cloud service is not creating the encryption key for you, but is allowing you to bring an encryption key that you have created, or which you manage outside of the cloud, to the cloud’s key management service. In this case the key you bring is imported into the multi-tenant, shared key management service and is then available through the cloud service provider key management service interface. Although you have exclusive control over the creation of the key and may store it outside of the cloud, it is important to remember that the storage and management of the imported encryption key is a shared responsibility between you and the cloud service provider. You do NOT have exclusive control of the key after it is imported to the cloud. Townsend Security fully supports bringing your own key to its Alliance Key Manager Key Management System for the Azure and AWS cloud platforms. Key custody remains fully with the organization and is not shared with the cloud service provider nor with Townsend Security. In summary: A rose is a rose is a rose. However, a Key Management Service is NOT a Key Management System. When discussing encryption key management care must be taken to understand the meaning of KMS. It can be quite different depending on the context. I hope this blog helps clarify the language and issues around key management. Every now and then you get something wrong and have to eat crow. Well, it’s my turn. Caw! 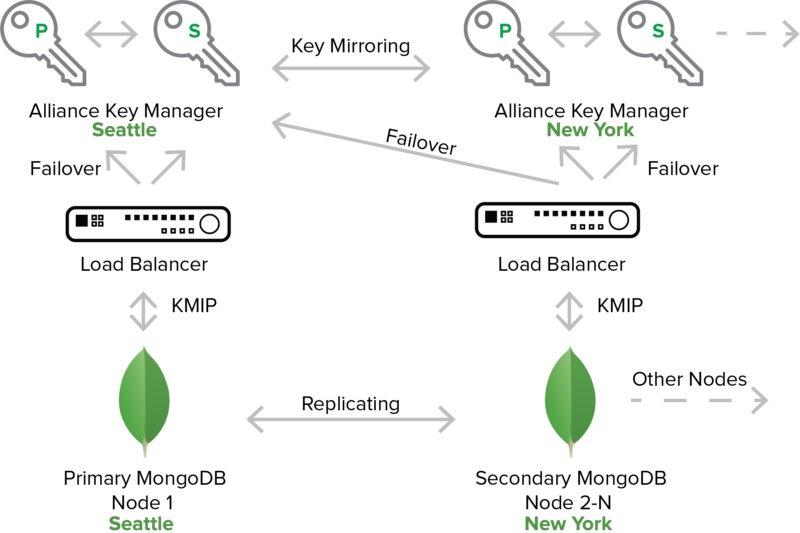 At the MongoDB World 2018 conference I gave the security session on encryption key management for MongoDB. 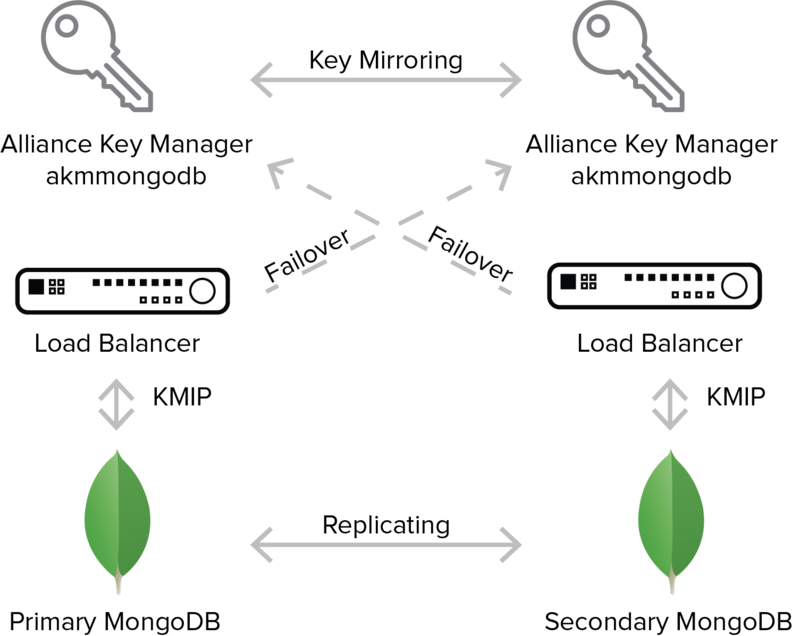 I love doing this session because MongoDB really makes getting encryption key management right by exposing a Key Management Interoperability Protocol (KMIP) interface available to plug in a key manager. 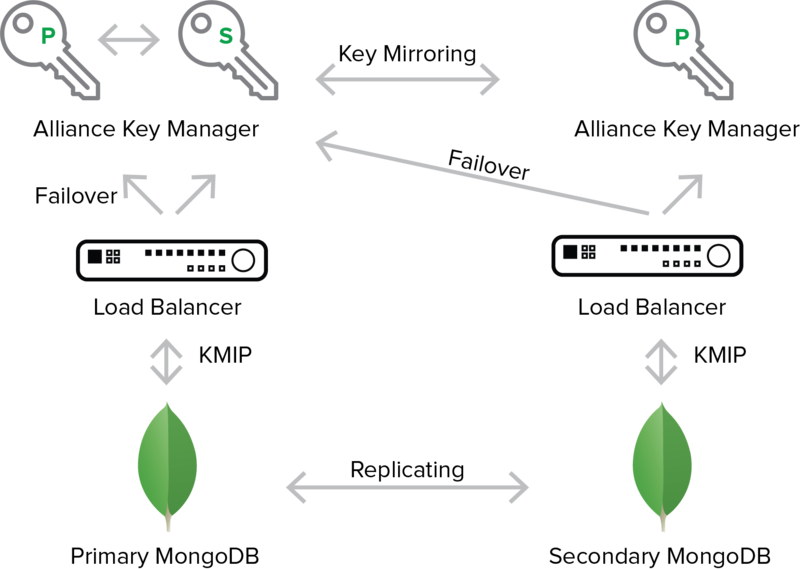 I talked about the MongoDB interface, about the principles of good encryption and key management, and then demonstrated how easy it is to deploy our Alliance Key Manager with MongoDB. It takes just a few minutes for a complete implementation. Key rotation is, of course, required under the PCI Data Security Standard (PCI DSS) and is a good security practice. The National Institute of Standards and Technology (NIST) addresses this in their Key Management Best Practices document Special Publication 800-57. See the section on crypto-periods for data encryption keys. This is where I ran off the rails. It was my impression that you had to create a new MongoDB database, encrypt it with a new key, and then copy the data into the new database. And that was not right! That is the procedure for some databases, but not MongoDB. Luckily Davi Ottenheimer, MongoDB’s head of security, and a MongoDB engineer were right there to set me straight. 1) Rotate the master key for the secondary members of the replica set one at a time. b. Upon successful completion of the master key rotation and re-encryption of the database keystore, the mongod will exit. c. Restart the secondary without the --kmipRotateMasterKey parameter. Include any other options specific to your configuration, such as --bind_ip. If using a configuration file, remove the security.kmip.rotateMasterKey. 2) Step down the replica set primary. a. Restart the stepped-down member, including the --kmipRotateMasterKey option. Include any other options specific to your configuration, such as --bind_ip. If the member already includes the --kmipKeyIdentifier option, either update the --kmipKeyIdentifier option with the new key to use or omit. c. Restart the stepped-down member without the --kmipRotateMasterKey option. Include any other options specific to your configuration, such as --bind_ip. This is pretty easy. You can find the documentation online at the MongoDB documentation site. If you attended my class in New York, or if you are implementing encryption and key management for MongoDB, I hope you find this helpful. As soon as the recording of the class is available I’ll send it to you in a new blog. Thanks to all of the MongoDB team members who put on the MongoDB World in New York! It was an exciting two days and I always learn a lot at the conferences. We are pleased to announce that Syncsort has acquired Townsend Security's IBM i security offerings. Solutions in the sale include Townsend Security's encryption, tokenization, authentication, FTP, as well as SIEM integration products. Syncsort is the global leader in Big Iron to Big Data software. The acquisition helps Syncsort deliver on its ongoing commitment to strengthening the security of the IBM i platform and to businesses that rely on its performance and resilience to drive the business forward. Townsend Security will continue in business focusing on Alliance Key Manager, our FIPS 140-2 compliant encryption key management solution that is in use by over 3,000 customers worldwide. Alliance Key Manager provides encryption key management and encryption services to a wide set of relational database solutions, big data solutions, and blockchain platforms. We are pleased that we will have an on-going partnership with Syncsort around providing the Townsend Security Alliance Key Manager solution to Syncsort customers. During the transition, Townsend Security will work closely with Syncsort to make sure that your IBM i product needs are met. As part of the acquisition, we will be sharing your account information with Syncsort and anticipate a full handover within 6 months. To learn more about Syncsort’s IBM i products and content offers, you can sign up here to be added to their mailing list. We thank you for your business and trust you will continue to experience the same high level of customer satisfaction and support with Syncsort. Microsoft SQL Server customers ask us whether they should use Always Encrypted or Transparent Data Encryption (TDE) to protect sensitive data. It is a relevant question, especially given the concern for the GDPR, and it is relevant to many other compliance regulations and data protection needs. Let’s explore these technologies in more detail and I think the answer will emerge. Always Encrypted is a relatively new, client-side implementation of encryption for SQL Server. That is, data is encrypted on the source system before you insert it into a SQL Server database. Implemented as a Windows driver, Always Encrypted intercepts your SQL statement before it leaves your client-side system (PC, web server, etc. ), determines if there are any fields in the SQL statement that need to be encrypted, establishes or retrieves an encryption key, encrypts the field, and sends the modified SQL statement to SQL Server for processing. One advantage of this approach is that the data is encrypted as it travels over the internal or external network, and as it resides in the database. A retrieval of the encrypted data reverses this process ensuring that the data is protected in transit. One significant limitation of Always Encrypted is that it can only be applied to a small subset of SQL operations. Many SQL operations are complex and cannot be processed by Always Encrypted. SQL Server Transparent Data Encryption (TDE) and Cell Level Encryption (CLE) are server-side facilities that encrypt the entire SQL Server database at rest, or selected columns. The client-side application is completely unaware of the implementation of TDE or CLE and no software is installed on the client-side system. All of the encryption tasks are performed by the SQL Server database itself. It is easy to implement and performs very well for most SQL Server customers. TDE and CLE are a part of the Microsoft SQL Server Extensible Key Management (EKM) strategy which has been a part of SQL Server since the 2008 edition. It is a mature technology and many organizations deploy TDE or CLE to protect their sensitive information. An encryption strategy is only as good as the encryption key management strategy. Creating, protecting, and using encryption keys is the hardest part of encryption, and for the sake of your overall security, it is important to get key management right. With Transparent Data Encryption the key management strategy is well defined through the Microsoft Extensible Key Management (EKM) Provider interface. Key management systems such as our Alliance Key Manager for SQL Server provide software written to the EKM interface specification and SQL Server customers get full encryption key management integrated through the EKM Provider interface. Always Encrypted does not provide a formal interface for key management. Instead, third party vendors must provide Always Encrypted drivers that implement an interface to a key management system. This means that the interface to the key management system is proprietary. Additionally, since the Always Encrypted implementation is a client-side deployment, each client-side application will have to have access to the key manager in order to properly protect and use encryption keys. This can be a challenge in distributed network topologies. The bottom line: you can achieve proper key management with either approach, but expect to deal with more complexity with Always Encrypted when you have distributed clients. Because Always Encrypted functions by modifying the SQL operation before it interfaces with the SQL Server database, and because many complex SQL operations will not work with Always Encrypted, I would only recommend using Always Encrypted when the application architecture is very simple. For example, you might want to use Always Encrypted to send data from an internal SQL Server database to a web-hosted SQL Server database and application. The data will be protected in transit and encrypted in the database. As long as your web application makes simple SQL queries to the database this approach can work well. Transparent Data Encryption and Cell Level Encryption are implemented directly in the SQL Server database itself. This means that complex SQL operations are fully supported and you will not find limitations imposed by your encryption or application strategy in the future. The SQL Server implementation of TDE and CLE also support a standardized interface for encryption key management. This means you will have choices in key management vendors and can readily find a solution. TDE also has good performance metrics for the large majority of SQL Server customers, and is exceptionally easy to implement. For the reasons outlined above I believe that Transparent Data Encryption or Cell Level Encryption implemented within SQL Server will almost always be the better choice for most SQL Server customers. You will not be locked into restrictions on the use of SQL operations, key management is well defined, and the encryption performance metrics are impressive. I hope this overview of the two SQL Server encryption approaches has been helpful. Please feel free to reach out with any questions you have.